A Profile of Pigs for Those Who Love Them! My wife is from Germany, and in her country pigs are used to represent good luck. They have a saying that goes "Ich Habe Schwein Gehabt" which means "I have had pig." This tradition dates back to when times were hard, and if someone was fortunate enough to have a hog to feed their family, they would indeed be lucky enough to say "Ich Habe Schwein Gehabt"! The lucky swine inspired my wife to start collecting them, and she now has a small assemblage of over 400 from around the world, including myself! This section is devoted to her and her love of this noble creature and all things pig. You have to admit, they are cute! We hope you will find it entertaining, enlightening, charming and fun. There's even a link to the Ironwood Pig Sanctuary, a home for abused and neglected pot-bellied pigs where you can adopt a pig and follow his progress! So have fun and maybe start your own pig collection by purchasing one of the unique pig gifts we have available. On this page I'll outline a some of the more popular breeds of pig as well as a few that are rare and almost extinct. We will be constantly adding more as our website grows, so stay in touch. Follow the links or use the nav bar to find out about famous hogs, pot-bellied pigs, and what they are like as pets. Being omnivores, meaning that these creatures consume plants and animals. They will also scavenge and have are happy to eat any kind of food. This can include insects, certain worms, the bark of trees, rotting carcasses, trash or garbage, and even their own piglets. Possibly half of all piglet deaths are due to either the mother pig crushing her babies, or killing and eating them. In the wild they will forage, and mainly eat leaves, grass, tree and plant roots, some flowers, and various fruits. The snout of this beast is made strong by a special bone, and they use their snout to dig into the ground for grubs, roots and especially truffles! They have a set of forty four teeth that can be used for crushing and tearing, depending on what particular food they are eating. The behaviour of these creatures will depend on whether they are wild or domesticated. In the case of the wild ones, they will forage for food and socialize in packs or groups. The male wild boar however tends to be solitary and roams the wilds looking for suitable females to breed with. Usually these herds of pig consist of between twenty and thirty animals consisting mostly of the sows and their young. Wild pigs will scavenge for food constantly and will feast upon just about anything edible they can find. Roots, nuts, berries, plants, insects, reptiles and their favourite truffles are prominent in their diet. The wild boar though has been known to attack and eat small animals such as deer and lamb. Swine have the reputation of being dirty animals - we've all heard the phrase "Dirty as Pigs", but in reality pigs are very clean creatures. Although they can harbor parasites that can be picked up by their human owners or tenders, this can be avoided if they are looked after properly. Keeping their environment clean of feces and having a vet tend to them regularly will ensure your animals are as healthy and parasite free as possible. Part of the reason these beasts are seen as dirty is because they love to immerse themselves in mud; but there's a reason for that. Bathing in the coolness of mud and water simply cools them down when the heat of summer gets too much for them. having ample shade for your pigs to retreat from the heat of the sun will cut down on their rummaging in the mud. If you can, build a hut for them, if not, put the pen in an area where trees will provide some shade. Keeping a supply of clean straw for them to lie in is also important to their health. They love a fresh straw bed to sleep in! It is also important to provide ample room for them to wander and forage in. These simple considerations will keep your pig happy, healthy and above all -CLEAN! The cleaner you keep the animal's environment, the healthier it will be. It's also critical to feed them the proper foods. Don't feed them meat. Grains and corn, plus left over vegetables are best to reduce the chance of parasites. Of course you need to make sure that your animals have plenty of water as well. Affection is also important to a swine's health and happiness. They love to be scratched and have their bellies rubbed. Interact with them in whatever manner you're comfortable with. even talking to them gently is a way to bond. They are very playful animals as well, so put a ball or old bucket in their pen; you'll be amazed at the antics they'll get up to. The Bearded Pig can be recognized by, suprise, its prominent beard. It also sometimes has tassels on its tail. It can primarily be found in Southeast Asia, primarily in Sumatra, Borneo, and the eastern Philippines—where it inhabits rainforests and mangrove forests. They are social creatures that live within a family structure. It can reproduce from the age of 18 months, and can be cross-bred with other species. The Visayan Warty is a critically endangered species of found on only two of the Visayan Islands in the central Philippines, and as a result, faces unique challenges to their survival in the wild. The challenges include little room to escape from predators, food shortages and hunting - these are the leading causes of the Visayan Warty's status as critically endangered. Due to the small numbers of remaining Visayan Warty's in the wild, little is known of their behaviors or characteristics outside of captivity.The Visayan Warty receives its name from the three pairs of fleshy "warts" present on the visage of the boar. Biologists speculate that the reason for the warts is to assist as a natural defense against the tusks of rivals during a fight. The boars also grow stiff spikey hair.They're the Punk Rockers of the Pig family! The Philippine Warty is found in the islands of Luzon, Biliran, Mindoro, Mindanao and Polillo. It is closely related to the Bearded Pig and was thought to be a sub-species like the Palawan Bearded pig. It was once found in most habitats (from sea level to up to 2800 m) but are now confined in remote forests due to loss of habitat and heavy hunting by noose traps or trigger set bullets. It is now extinct in the island of Marinduque. Pygmy Hogs are another endangered species of small wild boar, previously spread across India, Nepal, and Bhutan but now only found in Assam. The current world population is about 100-150 individuals. They are about 55 to 71 cm long and stand at 20-30 cm with tail of 2.5 cm. They weigh 6.6 to 11.8 kilograms. Their skin is dark brownish black and the fur is dark. Piglets are born grayish-pink becoming brown with yellow stripes along the body length. The head is sharply tapered and they have a slight crest of hair on the forehead and on the back of the neck. Adult males have the upper canines visible on the sides of the mouth. They live for about 8 years, becoming sexually mature at 1-2 years. They breed seasonally before the monsoons giving birth to a litter of 3-6 after a gestation of 100 days. In the wild they make small nests made by digging a small trench and lining it with vegetation. During the heat of the day they stay within these nests. They feed on roots, tubers, insects, rodents, and small reptiles. Conservation of the species has not been effective due to the lack of public support, unlike that for charismatic South Asian mammals like the Bengal Tiger or Indian Rhino. Their rarity contrasts greatly with the massive population of wild boars in India. The Wild Boar is the wild ancestor of the domestic swine. It is native in woodlands across much of Central Europe, the Mediterranean Region (including North Africa's Atlas Mountains) and much of Asia as far south as Indonesia, and has been widely introduced elsewhere. It is in the same biological family as the Warthog and Bushpig of Africa, the Pygmy Hog of northern India, Babirusa of Indonesia and others. It is more distantly related to breeds found in the southwest of North America and throughout Central and South America. Wild boars can reach up to 440 lb (200 kg) for adult males, and can be up to 6 feet (1.8 m) long. If surprised or cornered they may become aggressive - particularly a sow with her piglets - and if attacked will defend themselves vigorously with their tusks. The wild boar became extinct in Great Britain and Ireland by the 17th century, but wild breeding populations have recently returned in some areas, particularly the Weald, following escapes from boar farms. The Domestic Pig Pigs have been domesticated now for over 5,000 years, and are found across on every continent, except for Antartica, and just about every country in the world. There is not much difference between domestic and wild types, and domestics easily make the transition back to being wild, and have done so in some countries such as New Zealand, where they cause extensive environmental damage. In my country, Bermuda, sailors who were shipwrecked there in the 17th century found previously domesticated hogs that had found their way to shore from previous shipwrecks and returned to their wild state. Because of their mild manner and the fact that they will eat just about any form of food, they were easy to domesticate and early humans prefered them over cows and other livestock. People also used their hide for shields, their bones for tools and weapons, and their bristles for brushes. The useful animals found their way to North America compliments of early Spanish explorers, and those that escaped into the wild were happily eaten by the Native American Indians. Following is a listing and brief description of some of the major domesticated breeds (and a few rare ones!) from around the world. we'll start with some swine from merry old England! Berkshire Berkshires are quite stout black swine, usually with white legs or hooves, a white patch along the length of their snout, and occassionally white tipped tails. The snouts are dished, or concave, and are of medium length.Their ears are quite large and erect, and stand tilted towards their front. The Berkshire is quite proud looking, free of the wrinkled skin of some domestic breads, you might say it even has an air of English arrogance about it! The Hampshire The Hampshire is easily identifiable by the white band that circles its body at its forelegs. Another of the English "shire" breeds, (Hampshire, Berkshire, Yorkshire) it too has large erect and open ears and carries itself with a bit of pomposity. It is similar to the Berkshire in its body shape, possibly a bit more well muscled than the other "shires". The Yorkshire Babe was a Yorkshire pig! They're the pink ones with the intelligent pink eyes and curly tail usually used in cartoons or movies. The full grown Yorkshires are similar in stature to their "shire" brothers, very muscular, and are one of the most popularly breeds around, found in almost every state in America. The TamworthThe Tamworth is a reddish colored hog thought to have descended from the wild boar. Originally bred in Staffordshire, they take the name of the town of their birth, Tamworth, and are considered to be one of the purest breeds. These animals can often be seen wallowing in the mud to keep cool as they shed their usually dense bristle, which protects them from the sun's ultraviolet rays, in the summertime. They are the original sun-block users! Thomson and Arlene, aka "The Tamsworth Two", the two characters who escaped while being unloaded from a lorry at a slaughterhouse in the English town of Malmesbury, Wiltshire in January 1998 were Tamworths. Danish LandraceThe Landrace was originally bred in Denmark, the Large White Hog was brought from England and crossed with the native swine. They are white skinned and lop-eared, with a long body - the front legs shorter than the rear, giving them a bit of a stooped appearrance. Unfortunately for this little piggie, he is bred soley for pork production, namely bacon. The American Landrace The American Landrace is a cousin of the Danish Landrace. Their ears droop and slant forward, with the top edges nearly parallel to the bridge of its straight nose. They were bred by crossing imported Danish Landrace with Norwegian and Swedish hogs. The Angeln Saddleback The Angeln Saddleback, in Germany known as the Angeln or Angler Sattelschwein has very similar markings to the Hampshire, with a white band encircling its forward body and encompassing its forelegs. It lacks the muscular build of the Hampshire however, being a sight more fatty, and for this reason has become unpopular in todays health concious market. This little piggy went home! 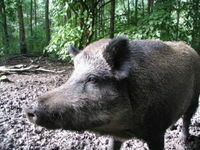 The Bentheim Black PiedA white, black-spotted hog, the Buntes Bentheimer Schwein (in German), is a rare breed of the domestic kind in Germany. 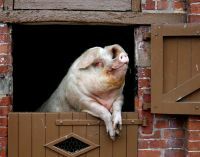 Another breed named after the area in which it was first bred, Bentheim, a district in Lower Saxony in the west of Germany, they came about in the early 1900's when local breeders crossed native swine with Berkshires and Cornwalls imported from England. They nearly became extinct in the 1950's and are now very rare with only approximately 100 still in existence. TuropoljeThe Turopolje is a critically endangered indigenous species of Croatia, and is considered to be one of the oldest breeds in Europe. It came into being in the Turopolje region which is situated between the Kupa and Sava rivers east of Zagreb. There are supposedly only about 50 of these precious pigs remaining in the world. Its hard to believe they are endangered as they are a resilient, hardy breed well adapted to harsh climates, and especially to a wide range of temperatures and wet and marshy lands, their natural habitat. They are capable of surviving harsh winters outside with a minimal of food. They are handsome looking with off-white curly hair and black patches. Kunekune The Kunekune (pronounced "coonie coonie") is a unique breed from New Zealand, the name being a Maori word meaning "chubby"! it is believed they were introduced to New Zealand by wahlers who brought them from other parts of Asia in the 19th century. The Kukune come in many shapes, colors and sizes, but all are distinctly identified by characteristic "tassels" that hang from its lower jaw. Kukunes come in a variety of colours that range from black, brown, white, ginger, cream, black and white, as well as ginger and black. They can also have a number of different coat types, from smooth sleek hair to coarse, curly coats. They are some of nature's friendliest animals, and make wonderful pets. They enjoy the company of humans are a suckers for cuddling and love having their bellies scratched! Red WattleThese hogs came from New Caledonia, which is a French Island in the South Pacific near Australia. They are a large, red animal with a fleshy wattle attached to either side of the neck. The wattles have no known function. The Red Wattle comes in a variety of shades of red and black, with mature animals weighing 600-800 pounds. Red Wattle hogs are known for their hardiness, foraging activity, and rapid growth rate. They produce lean meat notable for its flavor and tenderness. Mukota The Mukota is a strong, hardy breed from Zimbabwe, but is also found in Mozambique and Zambia. Its very tough when it comes to resisting disease, can go without food for a substantial amount of time and requires very little water, about a litre per day. it is entirely indigenous to these areas, meaning they originated there. There are two types of Mukota, both are black, however one type is short and fat with a stubbed snout, while the other has an alongated snout and has a razorback. Mulefoot Mulefoots are named so because their hooves are not cloven like most pigs but resemble more the hooves of a mule. They are primarily black in color though occassionally on may be found with white spots. they are quite large pigs, and full grown males can reach 600lbs. They are also a rare breed, with fewer than 150 believed to be in existence. The Mulefoot has a very gentle nature, and were at one time considered to be the highest quality of "ham-hog". Ba XuyenBa Xuyens are a crossbreed between Berkshires and Chinese pigs from the Mekong Delta area in Vietnam. They are stout little swine with stubby legs and are black and white in color, usually growing up to a modest 250lbs. HezuoThe Hezuo is from the Tibetan area of Gansu Province, China. The altitude in this region is high (2600 m), and the temperature low. They are out to pasture year round, and are characterized by long, coarse and dense bristles, a slow growth rate, characteristics of animals raised in cold temperature environments. Chester WhiteThe Chester White breed originated in Chester County, Pennsylvania and thereby derived its breed name. At first it was called the Chester County White, but later the "county" was dropped. If you've ever seen an old show called "Green Acres" on cable, the animal star in that show Arnold Ziffle was a Chester White. They are, as their name suggests, all white with slightly drooping ears and are absolutely domesticated, however the males of this species can be somewhat agrressive. Does this mean that Arnold Ziffle was really a girl? As I mentioned, these are just some of the major and a few of the more rare breeds of pig. We will be constantly adding more as our website grows, so stay in touch. What about the pot-bellied pig you may ask. Well he is so special, we have a whole seperate section for him! Click on the link below to visit the pot-bellied pigs!